A freshly made orange shandy is an absolute delight on hot summer days. It's a great beer-based mixed drink that's very easy to make and outshines any bottled shandy from a store. This recipe adds a couple of extra garden-fresh flavors to the mix, creating one of the tastiest shandies in a pitcher-size batch, so it's ready to share with friends. The recipe begins with a basil-rosemary orangeade. It's made just like fresh-squeezed lemonade but uses a homemade basil-rosemary simple syrup to sweeten the orange juice. The herb-kissed juice is fantastic on its own and it gets even better when poured with a great beer. Wheat ales are a favorite for this recipe, though lagers will result in an equally satisfying and refreshing shandy. Tequila and Beer in One Drink? Of Course That's Not Prohibidos! In a small saucepan, bring 1 cup of water to a boil. Stir in the sugar until it is completely dissolved. Reduce the heat and add the orange zest, rosemary, and basil. Cover and simmer for 15 minutes. Remove from the heat and allow the syrup to cool completely, keeping the pan covered. Strain out the herbs and zest. Combine the syrup, orange juice, and 2 cups of water in a pitcher. Stir and chill in the refrigerator for at least 2 hours. Serve the orangeade within a few days. In an ice-filled tall glass, pour the basil-rosemary orangeade until the glass is half full. Top with beer and garnish with an orange slice. 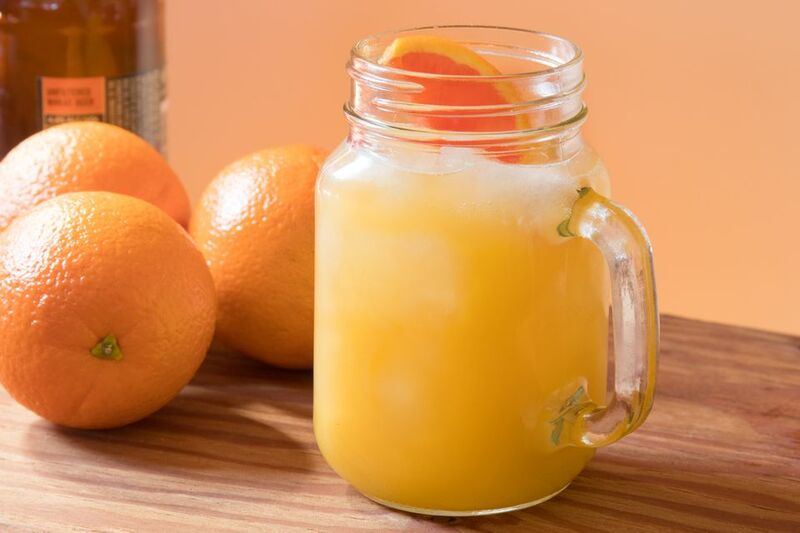 The best-tasting orangeade is made with freshly squeezed orange juice. You should be able to get 3 ounces of juice from an average orange. To get 4 cups, count on juicing 10 oranges. There's no need to remove all of the rosemary leaves from the stem. Simply toss a couple of whole sprigs (about 4 inches long) into the syrup. On the other hand, it is best to use only basil leaves as the stem can throw off the flavor. Luckily, the herb's leaves are large so it's very easy to pick them. Use a paring knife or sharp peeler to cut the pieces of orange zest. Ice is a nice addition to this shandy, but it's not necessary if your beer and orangeade are cold. It's also a good idea to serve it in chilled glasses. The orangeade can be sweetened with any of a variety of simple syrups, including unflavored for a pure orange flavor. Try it with cinnamon or ginger for a hint of spice, give it a minty twist, or try another herbal combination like lavender and sage. Add a shot (1 1/2 ounces) of tequila or vodka to each glass when building the drinks for an extra kick. How Strong Is a Basil-Rosemary Orange Shandy? Since this shandy is a 50-50 mix of orangeade and beer, the final alcohol content will be half the strength of the beer you choose to pour. If you add ice, dilution will play a role as well, helping to create a very mild drink. For instance, if your beer is 5 percent ABV, the shandy will be just 2.4 percent ABV.